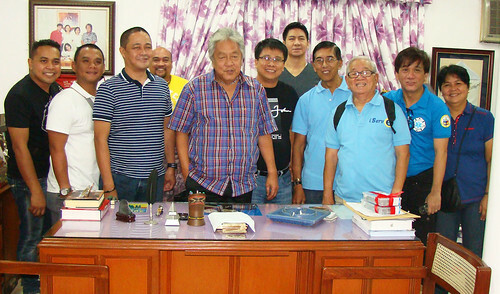 The Pasig City team, led by Pasig DILG chief Jay E. Timbreza (6th from left), Pasig Liga President Ferdinand A. Avis (3rd from left), Pasig City DRM action man Ritchie Van Angeles (2nd from right), Pasig City, Chief Fire and Rescue: Noel Perez (2nd from left), Barangay Affairs Office Head (internal) Gregorio Evangelista (3rd from right), Barangay affairs office head (external): Joselito Comste (4th from right), posed with Mayor Vicente “Dongkoy” Y. Emano during their visit here, February 16. They introduced and discussed with the Mayor their (Pasig’s) existing Disaster Management system, installed shortly after their experience with typhoon Ondoy, which they say has tremendously helped in keeping them always ready and prepared for almost all forms of disaster most especially flooding. The system consists of CCTVs, repeaters, SMS system, and other early warning equipment, most of which are of Korean technology, and had been gradually built after typhoon Ondoy struck their city. The system costed them around P90M but apparently no amount can pay for the security and preparedness Pasig now enjoys because of the disaster management system they now have.